Record numbers of Americans ditched their cars and took public transporation in 2012 and some of the largest increases occurred right here. We love this story and not just for the reasons you think. What this tells us is that L.A. — once the car capitol of the world — has considered options to driving and is taking them. 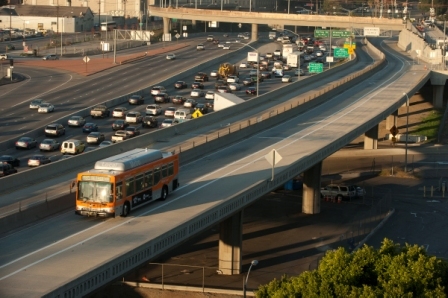 It’s a sea change but one that bodes well for a city hugged by freeways. Can Beijing be far behind? Are you ready for this Sunday’s marathon detours? Probably not. As we’ve previously posted, there will be detours of buses, as well as of cars. Also worth re-mentioning, Metro will run FREE shuttles from the Expo Line Culver City station to Olympic Boulevard/11th Street in Santa Monica during the marathon as an alternative option for those traveling from downtown to the beach. Here’s the list from Big Blue Bus. Glendale City Council Member Ara Najarian has been reconfirmed to the Metro Board of Directors. More women are driving. So what? Women drive differently than men and have changed driving trends as a whole. Crash patterns are different. But also, women are much more likely to drive compact, fuel-efficient cars. And that’s a good thing for our air quality, not to mention the small issue of climate change.